Our band camp is an overnight program for middle school-aged youth (rising 7th to 9th grade). Campers will participate in thorough group rehearsals and sectional master classes, as well as free time and evening activities. The camp will culminate with a final concert. Campers and staff will be housed in comfortable dorm style cottages and rooms and served “southern cooking” by our food service staff. Matthew Price, from Fayetteville, Georgia, will be our clinician, assisted by band directors who will facilitate sectional break out sessions. 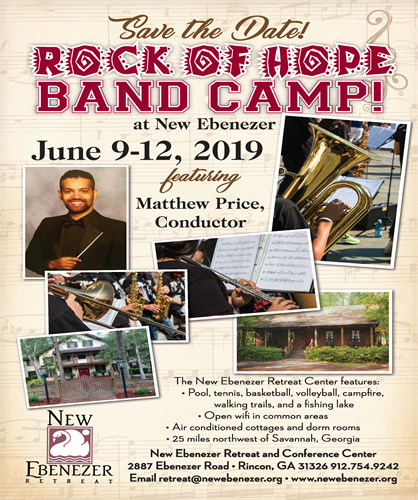 Rock of Hope is an overnight camp running June 9th to June 12th, 2019. Check in on June 9th is from 3:00PM to 4:00PM. Check out on June 12th is from 4:30PM to 5:30PM. We will hold a band concert following check out. Campers are responsible for bringing their own instruments with the exception of percussionists. The cost of $285 per camper covers food, lodging, and instruction for the week.